So today, April 26th is apparently Alien Day; the numerical date (4-26) is a nod to LV-426, the planet where both the movies Alien and Aliens largely take place. Normally I give this kind of corporate shilling a pass; I don’t care at all about that May the Fourth Be With You/Star Wars thing. However, Aliens was bar non my favorite movie when I was growing up. I was obsessed with it. 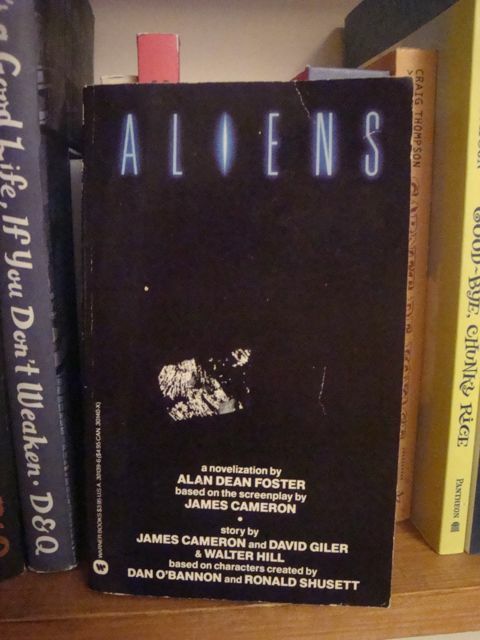 So now for your reading pleasure, let me re-present a Thrift Store Finds post I did back in 2011 where I reread and gave commentary on the novelization of the movie Aliens. The post rated a comment from the author of the novelization himself, Alan Dean Foster! Less a review and more a trip down memory lane, today’s (and next week’s) thrift store finds are a couple of novelizations based on and around the 1986 movie Aliens. This week, let’s look at the novelization. Next week, the novelization of a novelization. Photos of My Big Fat Notebook!!! Hey here are a bunch of cool looking pages from Everything You Need To Ace Science in One Big Fat Notebook: The Complete Middle School Study Guide, coming to bookstores this August by the fine folks at Workman Publishing. I did the doodles! I thoroughly forgot to plug this! This weekend I’ll be on a panel at the Gem City Comic Con where I’ll be discussing comics, teaching, and where the two intersect in my classroom! Come on by and you’ll have the chance to hear my yammer! You are currently browsing the Teachable Moments blog archives for April, 2016.